Lucas Corso is a book detective, a middle-aged mercenary hired to hunt down rare editions for wealthy and unscrupulous clients. When a well-known bibliophile is found dead, leaving behind part of the original manuscript of Alexandre Dumas’s The Three Musketeers, Corso is brought in to authenticate the fragment. He is soon drawn into a swirling plot involving devil worship, occult practices, and swashbuckling derring-do among a cast of characters bearing a suspicious resemblance to those of Dumas’s masterpiece. Aided by a mysterious beauty named for a Conan Doyle heroine, Corso travels from Madrid to Toledo to Paris on the killer’s trail in this twisty intellectual romp through the book world. I almost gave up this book. I almost did. But once I got about fifty or so pages in, when they started talking about the Satanic texts and The Nine Gates, I was hooked. 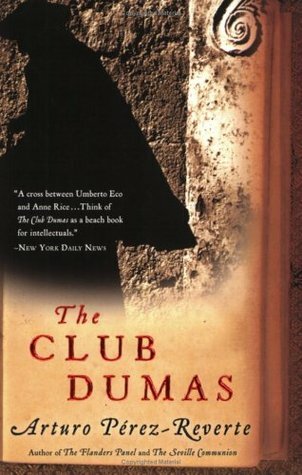 The front of The Club Dumas describes it as Anne Rice meets Umberto Eco, which worried me. Anna Rice I like, but I tried to read Eco’s The Prague Cemetery some months ago and I just couldn’t do it. But this, I could. You definitely have to really love books and the history of books, including how they’re made. There’s a lot of discussion about book-making techniques across the years, including bindings, woodcuts, printing presses, etc. If the thought of that makes you go to sleep, don’t read this book. The plot is definitely on the order of a mystery/thriller, but it’s very sedate. There aren’t bombs going off in every chapter. The Club Dumas is very well-written, the sentences taut and beautiful. Sometimes the plot becomes a little confusing, as it often seems poised to veer off into the surreal. One of the characters is referred to simply as “The Girl” because she gives the main character, Corso, the false name of Irene Adler, of Sherlock Holmes fame. This book is a treasure if you really know your literary history, particularly where Dumas and Sherlock Holmes are concerned. There’s a lot of nice references that the educated reader will notice and appreciate. The end let me down though. It grew too convoluted. I’m still not sure how the two major plot lines connect, nor am I sure exactly what happened in the last hundred or so pages. Overall, while The Club Dumas was a fairly enjoyable way to pass some time, I wouldn’t necessarily recommend it.